172 Marlborough is located on the south side of Marlborough, between Dartmouth and Exeter, with 170 Marlborough to the east and 174 Marlborough to the west. 172 Marlborough was built in 1874-1875 for dry goods merchant Eben Jordan (founder of Jordan, Marsh & Co.), one of six contiguous houses (166-168-170-172-174-176 Marlborough) built for him between 1874-1875 (166-168-170-172 Marlborough) and 1876-1877 (174-176 Marlborough), designed as three symmetrical pairs of houses. 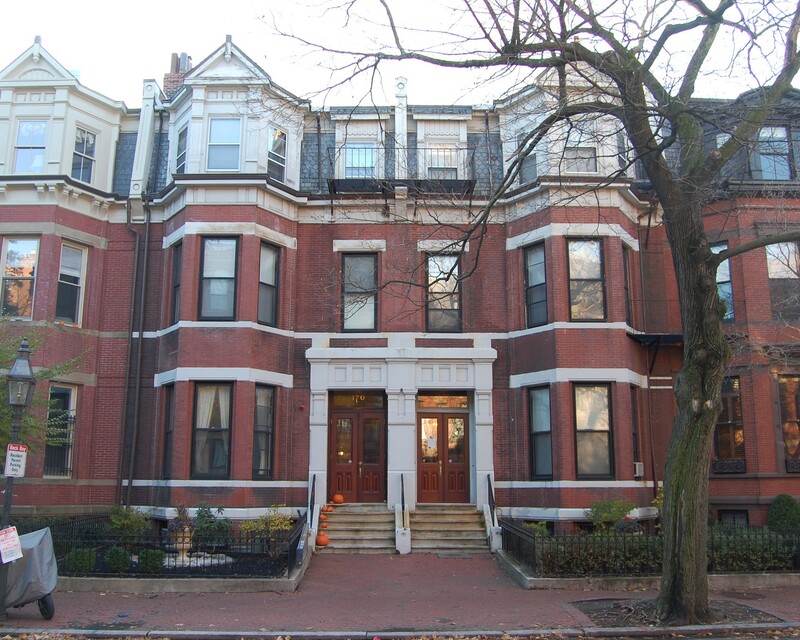 Click here for an index to the deeds for 172 Marlborough. On June 14, 1876, 172 Marlborough was acquired from Eben D. Jordan by his son, James Clark Jordan. He and his wife, Helen Lincoln (Stevens) Jordan, made it their home. They previously had lived at 76 Chestnut. On June 15, 1876, James Jordan transferred the property back to his father as trustee for the benefit of Helen Jordan. James Jordan was a member of his father’s dry goods firm. James and Helen Jordan continued to live at 172 Marlborough in 1884, but by the 1884-1885 winter season, had moved to 62 Beacon. Helen Jordan’s trust continued to own the property. 172 Marlborough was not listed in the 1885 and 1886 Blue Books. By the 1886-1887 winter season, 172 Marlborough was the home of Dr. Thomas Waterman, a physician, and his wife, Harriet Henchman (Howard) Waterman. 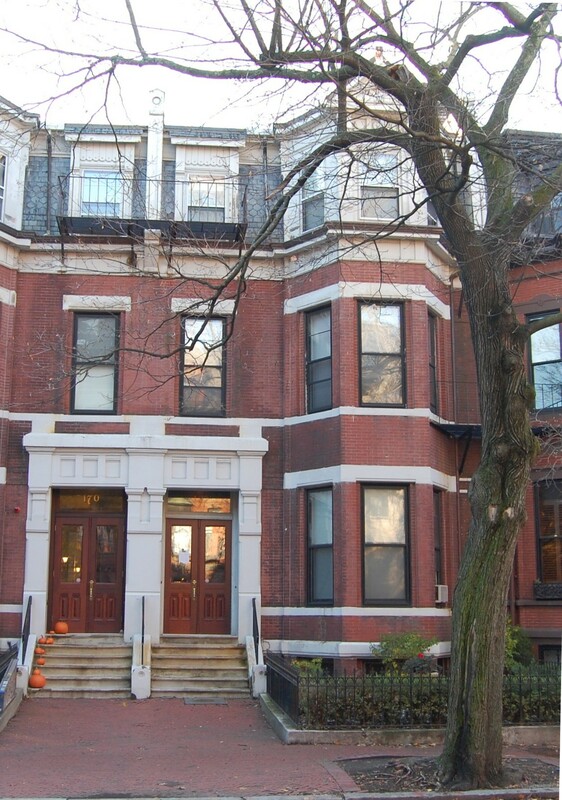 They previously had lived at 146 Boylston, where he also maintained his medical offices. 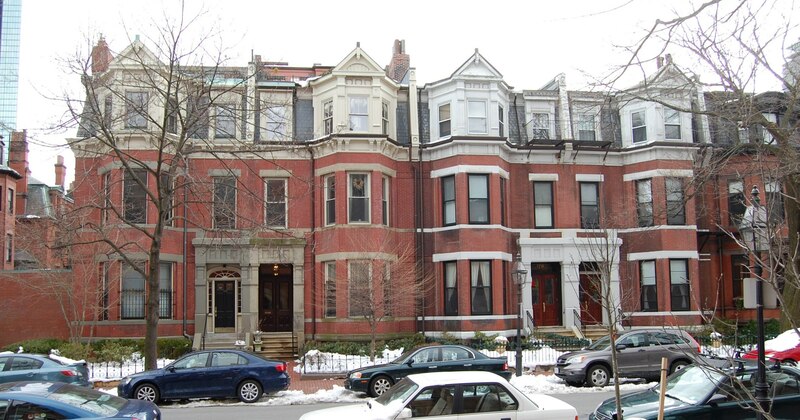 James and Helen Jordan continued to live at 62 Beacon in 1888, but separated soon thereafter. He continued to live at 62 Beacon and later moved to San Francisco, where he lived for the rest of his life. Helen Jordan moved back to 172 Marlborough with their two daughters, Helen Stevens Jordan and Marion Jordan. The Watermans moved to 68 St. James. During the 1892-1893 winter season, Helen Jordan was living elsewhere, and 172 Marlborough was the home of John Emory Tippett and his wife, Clara (Bentler) Tippett. They previously had lived at 185 West Chester Park. He was Superintendent of the Boston Art Club at 270 Dartmouth. The Tippetts had moved to the Hotel Huntington (Huntington at Blagden) by 1894 and 172 Marlborough was once again Helen Jordan’s home. Helen Jordan’s daughter, Helen, married in June of 1906 to Alfred Talbot Baker, a bond broker. After their marriage, they lived in Concord. They subsequently divorced and Helen (Jordan) Baker and her son, Alfred Talbot Baker, Jr., were living with her mother and sister at 172 Marlborough by the 1908-1909 winter season. She continued to live with them during the 1909-1910 winter season. During the 1910-1911 winter season, Helen Jordan and Marion Jordan (and possibly Helen Baker) were traveling abroad, and 172 Marlborough was not listed in the 1911 Blue Book. By the 1911-1912 season, Helen and Marion Jordan had resumed living at 172 Marlborough; by the 1912-1913 season, Helen Baker was living in an apartment at 220 Marlborough. Marion Baker married in February of 1913 to William F. Bentinck-Smith. After their marriage, they also lived in an apartment at 220 Marlborough. Helen Jordan continued to live at 172 Marlborough during the 1919-1920 winter season. During the 1920-1921 winter season, 172 Marlborough was the home of MacGregor Jenkins and his wife, Alice B. (Duncan) Jenkins. They also maintained a home in Dover. MacGregor Jenkins had been associated with Houghton, Mifflin as business manager of the Atlantic Monthly from 1890. In 1908, when Houghton, Mifflin ceased publishing the magazine, he was one of the organizers of The Atlantic Monthly Company, which continued its publication. He served as treasurer of the company until his retirement in 1928. He also was the author of numerous books and articles. By the 1921-1922 season, they had moved to 22 Marlborough. 172 Marlborough was not listed in the 1922 and 1923 Blue Books. By the 1923-1924 winter season, 172 Marlborough was the home of attorney Charles Sedgwick Rackemann and his wife Fanny S. (Pomeroy) Rackemann. They previously had lived in Milton. They continued to live at 172 Marlborough during the 1925-1926 winter season, but moved thereafter to 168 Marlborough. On April 10, 1925, 172 Marlborough was purchased from Helen Jordan’s trust by Christine J. (Murdock) Manahan, the wife of Ernest Manahan. They also maintained a home on Little’s Point in Swampscott. Ernest Manahan owned a women’s apparel store at 280 Boylston. 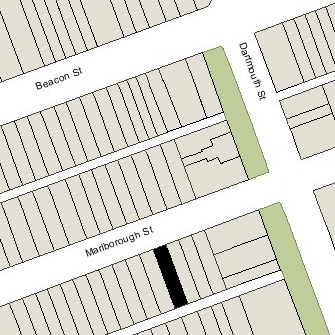 They continued to live at 172 Marlborough in 1935, but had moved to an apartment at 330 Dartmouth by 1936. On October 14, 1935, the Massachusetts Hospital Life Insurance Company foreclosed on its mortgage to Christine Manahan and took possession of 172 Marlborough. 172 Marlborough was shown as vacant in the 1936 Boston Directory. In July of 1937, Massachusetts Hospital Life Insurance applied for (and subsequently received) permission to convert the property from a single-family dwelling into a lodging house. Conrad Zeverin Granath and his wife, Myrtle H. (Fredenburgh) Granath, lived at 172 Marlborough from 1937 and probably were the operators of the lodging house. They previously had lived at 50 Gloucester. He was an embalmer and later would become director of a funeral home in Medford. They continued to live at 172 Marlborough in 1939, but had moved to Brookline by 1940. On June 26, 1941, 172 Marlborough was acquired from Massachusetts Hospital Life Insurance by Harriett Elizabeth (Burns) Brown, the wife of Everett Alonzo Brown, who operated it as a lodging house. She previously had lived at 295 Newbury, where she also had operated a lodging house, and many of her lodgers moved with her to 172 Marlborough. She was living apart from her husband, a former telegraph operator who lived in Franklin; he died in September of 1947. On March 30, 1948, 172 Marlborough was purchased from Harriett Brown by Ingrid S. Hanson. She previously had been a lodger at 114 Beacon. On May 16, 1957, 172 Marlborough was acquired from Ingrid Hanson by Maria Margarete de Lozano, the wife of Dr. Armando de Lozano, a pathologist. They lived in Jamaica Plain. 172 Marlborough continued to be operated as a lodging house. On April 16, 1962, 172 Marlborough was acquired from Maria Margarete de Lozano by Beatrice H. Pattenden and Octavia Morley (Sawyer) Walsh, the widow of Edward M. Walsh. Beatrice Pattenden lived at 172 Marlborough and operated it as a lodging house. Octavia Walsh lived at 191 Beacon. She owned the Walsh Sprinkler Company, dealers in automatic sprinkler systems. On September 16, 1963, 172 Marlborough was acquired from Beatrice Pattenden and Octavia Walsh by real estate dealer George P. Demeter. On February 1, 1996, he transferred the property to the Yia Yia Realty Limited Partnership (the general partner of which was one of George Demeter’s affiliated companies); and on January 2, 2007, it transferred the property to the LIA 172 Marlborough Limited Partnership (the general partners of which was another of George Demeter’’s affiliated companies). In November of 2013, Alexandra Demeter applied for (and subsequently received) permission to legalize the occupancy as eight apartments, indicating that had been the use for many years. 172 Marlborough remained an apartment building in 2016.